Last January Fire Rescue Fitness launched the 2016 FRF Fit for Duty Challenge with the hopes of promoting health and fitness within the fire service. The goal of the Challenge was to motivate Fire Rescue Athletes to treat their health like “athletes” do, to workout and eat to better perform the duties of the job. The results are in and I think together we are making an impact. 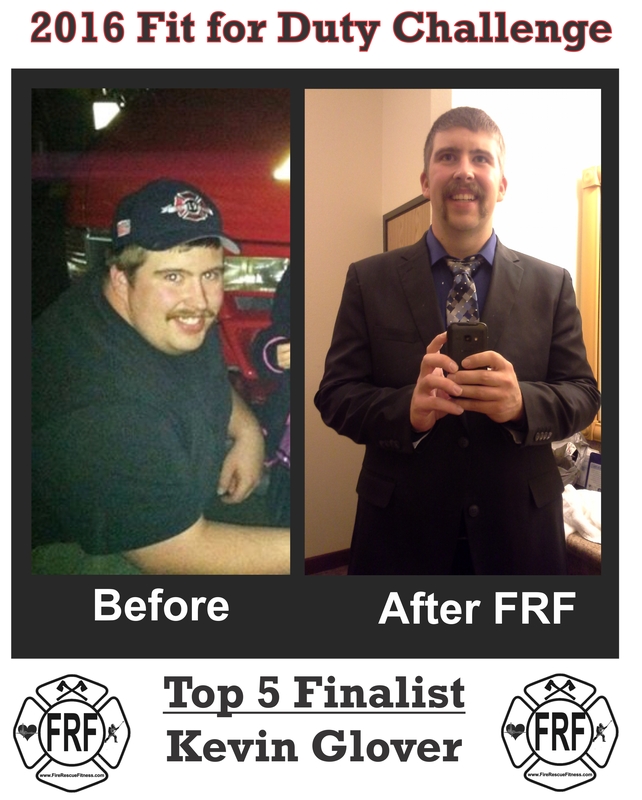 This year over 100 Fire Rescue Athletes entered their results and inspiring testimonials on how the Fire Rescue Fitness Workouts helped them get Fit for Duty and how they motivated others to do the same. I am so proud to announce that Kevin Glover is the 2016 FRF Fit for Duty Champion. Congratulations to Kevin and the other winners of the Challenge! You are all Champions! Click the video below for a complete rundown of the Top 5.
and…our Most Inspiring Athlete is Jay Nidiffer! Thank You from the bottom of my heart, I am humbled, honored and proud of the FRF Nation!